Running a successful event provides an excellent opportunity to showcase your organization. Whether your target audience is customers, membership or your employees, whether the event is a small seminar, employee or membership function, trade show or a large conference, a successful event provides profitable benefits. Getting it wrong can have detrimental consequences. Getting it wrong however can have detrimental consequences. Considerable investment goes into organizing and running a successful event, small or large. There is the financial investment of direct running costs, as well as the cost of your organization’s time preparing the event. At higher risk however is your organisation’s reputation. 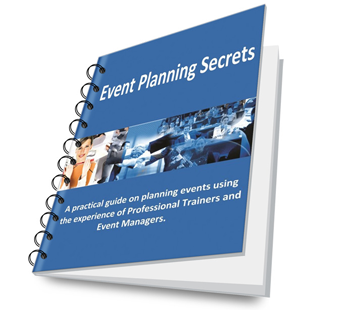 That’s why we prepared the “Event Planning Secrets” manual to provide you a practical guide for running events like conferences, workshops, road shows and seminars whether an internal event involving only your staff, or external, involving invited delegates. The manual is aimed at organizations whose mainstream business is not event management. The content is compiled from globally sourced information using the practical experience of professional trainers, event managers and promotional agents gleaned over many years, so the advice given is tried and tested and it works. It is intended to guide people new to events and provides checklists, flowcharts and examples to help you along the way. Experienced event managers will also find useful hints and tips that will help to minimize the stresses and complications that are inevitable when coordinating large numbers of activities and people. The manual takes a step-by-step approach to the entire project from the very first ideas that lead to the design of an event through to comprehensive preparation steps, practical guidance about selecting venues and timing your event to maximize attendance, booking and payment procedures including online booking, a blow-by-blow reference to running the day, follow-up techniques, both conventionally and on-line, and the necessary de-briefing stages. The manual also deals with many of the common problems that occur along the way and provides solutions, suggestions and valuable problem-solving techniques to tackle them. The manual is divided into sections dealing with the major activities in detail. At the end of each section a useful checklist provides a summary of the key points to be used as a handy quick reference. Included is a bonus supplementary section covering the organization and management of a trade stand at an exhibition. Although this shares some of the same approaches required for running other types of events, it demands a different course of action to engage the audience and to guarantee success. The manual is written largely in non-technical language. Where this has been unavoidable, we have provided explanations and examples based on real-life situations to help with clarification. Managing events is a little like learning to swim. Few of us will learn much more than fear by being thrown in at the deep end. This is an opportunity to keep one foot on the bottom of the pool while you practice your technique. The manual is organized in a broad range of easy to read and understand topics. This makes it simple to focus on just selected key areas of interest. Choosing the right venue is a critical first step. Section 2.4, page 16 outlines a number of key suggestions to consider what is right for your event. Branding – No event is too small to have its own identity. Even a one hour seminar should have some sort of a personality to catch the imagination of the potential audience. Section 3.3 page 29 starts the discussion on Designing, Branding and writing event material. On page 33 learn how to get the best possible performance from your speakers. Marketing and promoting an event rarely involves just one activity. It often requires a mixture of creative, organizational and persuasive skills overlaid by a tenacious streak. Find out in Section 4 from page 38 about deciding on invitations, advertising, editorials and press releases. Discover on page 46 which are the best days to conduct a seminar and what days to definitely avoid. Getting a good first impression is the first step towards a successful event. From page 49, learn how to avoid making a mess of this critical stage. In section 7.2, page 60, understand which type of venue setting is best suited for your function such as conference style, seminar style, etc. On page 68 discover a valuable tip on how to help your guests feel right at ease as soon as they walk in. You cannot expect to satisfy everyone 100%, but you can get close by understanding a number of key principles. If your workshop is designed to teach, section 2 will show you the four learning styles that exist amongst people and how to organize your event to appeal to all these learning styles to maximize the impact of your event. Equally important is when you evaluate the success of the event, page 78 discusses how to understand these four styles of learning to more effectively evaluate feedback. If you decide to exhibit at a trade stand answer several important questions on page 92 to avoid common mistakes which can cause you run into the problem of confusion and complexity and lower the return on your investment. “Organizing an event” is such a simple phrase but in reality the task is like an iceberg. There is so much more under the surface than the phrase suggests. This manual will help you develop a well thought out plan to avoid common traps so your event doesn’t descend into chaos or become a burden rather than the well-oiled machine it deserves to be. You can’t lose with our 100% Money Back Guarantee. Find out for yourself. That’s why your satisfaction is guaranteed with our 100%, no-questions-asked, money-back guarantee. If you aren’t absolutely thrilled with our manual, just contact us and we’ll refund 100% of the cost of the manual. So you have nothing to lose and everything to gain. If you consider the thousands of dollars it costs to run an event, the cost of your organizations time, and the potential profitable outcome of a successful event, A$47 is a minor investment to access the valuable information provided in this manual. Plus if for any reason you are not satisfied with your purchase, simply request your money back with the 100% money-back guarantee. As a special bonus, if you purchase MyBookingManager’s online booking manager service within the next six months to manage bookings for your next event, we will offer you a full reimbursement for the total cost of the manual. That way you get the manual, including all the 100 pages of valuable tips and guidelines for absolutely FREE. This means you can start planning now to make sure your next event is the success you deserve. Purchase your copy of “Event Planning Secrets” now and start planning to succeed. Payment is accepted by credit card and your manual will be available for immediate download.To ensure your next event is the success you deserve, purchase your copy of the manual now by clicking ORDER NOW. PS. Receive the manual for FREE, order the manual now and obtain a full reimbursement when you order mybookingmanager’s online booking service within six months. PSS. Order now and start using all the tips and guidelines now to make sure your next event is the success you deserve.